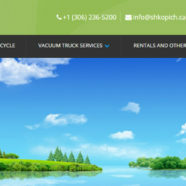 Shkopich Enviro’s hydrovac services helps utility companies and contractors find new ways to save money and improve safety in the Hydro Electric and Utilities industry. Hydrovacs can compliment and assist backhoes in many trenching applications. They also provide the operators with a clear line of sight to buried lines. Today we offer Liquid and solid waste transfer & Recycling services in the Northwest. We are a proud local and family owned company that strives to offer superior customer service.